B Radicals is a jam band, but not necessarily a basement/house-party band. (They do practice in a basement, though, and they probably would play your house party if you asked them). This is an atypical set of musicians who rely heavily on grooves and improvisation. Instead of being overdrawn and sloppy, their sound is textured and well-rehearsed — improvising in all the right places. 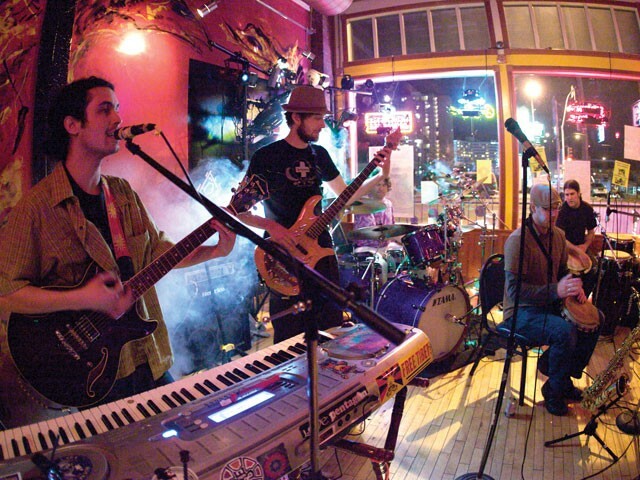 The band of local musicians formed as the B Radicals in 2008 through mutual scenes and house parties. Since then, they’ve taken their breed of rock, funk and experimental music to wherever there’s an audience willing to listen. This month, they’ll play the Viking and Sunset Junction, but also a farm and Mount Spokane’s ski lodge. The five-person band is quick to discuss and politely disagree over just about anything but their name. Radical means root, says Bradford Little, the band’s guitarist, keyboardist and vocalist. Their funky combination of drums, conga, saxophone, guitar and bass creates a loud, rock- and blues-heavy sound. The dual percussionists are magnetic, and the saxophone, when used, eloquently breaks up a monotonous jam. It’s the eclectic type of music you’d expect to hear at a barter fair, just more polished. Headlights from Riverside Avenue streak though the windows at Lions Lair in such a way that they almost seem like a part of the show. Little says his theater lights and fog machine help create the vibe the band is looking for. “We try to bring people into the vibration as soon as possible,” he says. The Free Tibet bumper sticker on the keyboard reflects about half of the audience. The band has a faithful following, and on most nights, you’re sure to see a troupe of hula hoopers (the bassist is engaged to one) and a man at the back of the audience in a Sublime T-shirt, patting his belly to the drum beats, dancing by himself. Little has written most of their 50 original songs and says he’s greatly influenced by Santana and Bob Marley. “Marley believed you could cure the world of any disease through the power of vibration,” Little says. For this band, it’s not so much about the music as it is about the experience, he says. “The next thing you know we’ve been jamming for 20 minutes or so, and we have to look back up to see if we’ve lost people,” Little says. The rest of the guys have a tendency to levitate in one part, adds percussionist Lancer Reichle — it’s up to the drummers to bring them down. The band says they play to and for one another and would be happy if they were just locked in a room at one permanent practice session. The audience, they say, provides the final element that makes playing music worthwhile. Life is meant to be joyful, Little says — so music is, therefore, joyful. Onstage, the B Radicals are one of those bands that makes you appreciate live music. Each performance sounds as raw and humble as the countless live shows they’ve recorded. There’s something to be appreciated here in watching something artistically created on the fly. B Radicals play with Hip Gravy at Sunset Junction on Friday, March 26, at 9 pm. Tickets: $5. 21 . Call 991-2470.